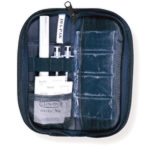 The Dia Pak Deluxe helps you to organize a 2-week supply of your insulin and related diabetic supplies. 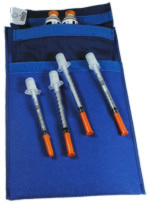 This insulin pack is made of durable nylon and is water resistant. 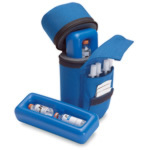 It has many pockets and compartments to hold insulin bottles, pens and diabetes testing supplies. Cool Gel Pack not included. Measures 6 in x 8 in x 2 1/2 in. Available in blue. Belt and shoulder strap sold separately.